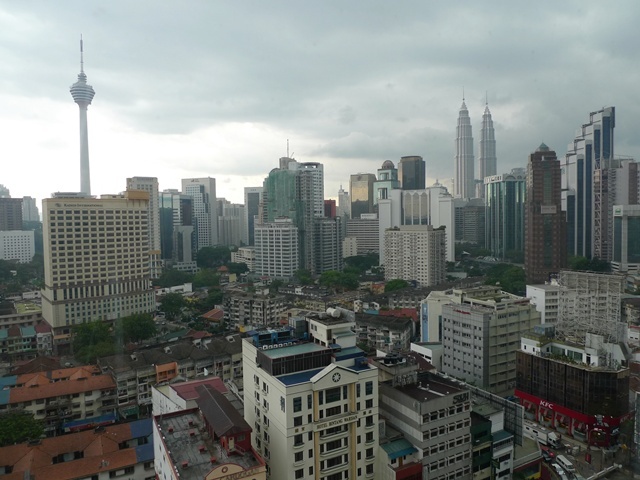 The cloudy view of the skyline taken through my window …. Lately I haven’t been blogging much bout Ipoh food. Not to say Ipoh’s boring, mind you. (What? You REALLY had that in mind, didn’t you?! Hmm, I’ll prove you wrong, one of these days!). Still have yet to end my “Hanoi Saga 2009” (cliche at best? =P) (you can click HERE for the first SEVEN chapters), and I’m already knee deep with workload and travelling, the next 6 days will be spent in a camp. Possibly military boot camp of sorts, with critters from all genus/species roaming freely, communal showers with dripping faucet (or even worse, water-less ones), a mere 5 hours of sleep daily, and meals served ala prison-style, each ‘prisoner’ with his/her own tray of white rice and curry. And the customary orange. Now on to better times …. 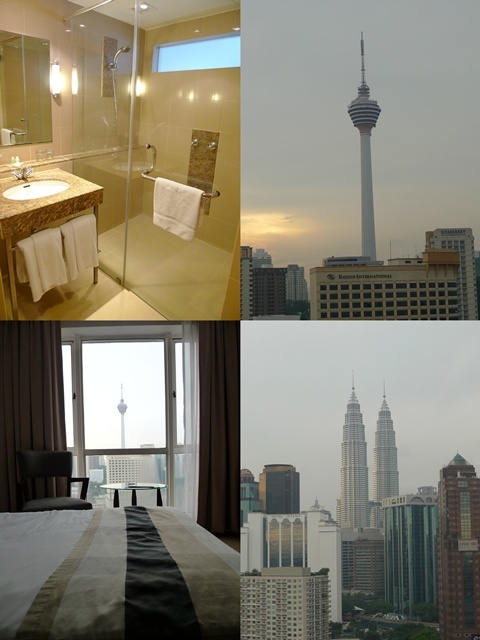 Last weekend was spent in KL for a short stint, putting up in Hotel Capitol in Bukit Bintang, within walking distance to prominent shopping complexes around the Golden Triangle, namely Sungei Wang Plaza, Pavilion, Low Yat, Lot 10, Times Square and Starhill Gallery. 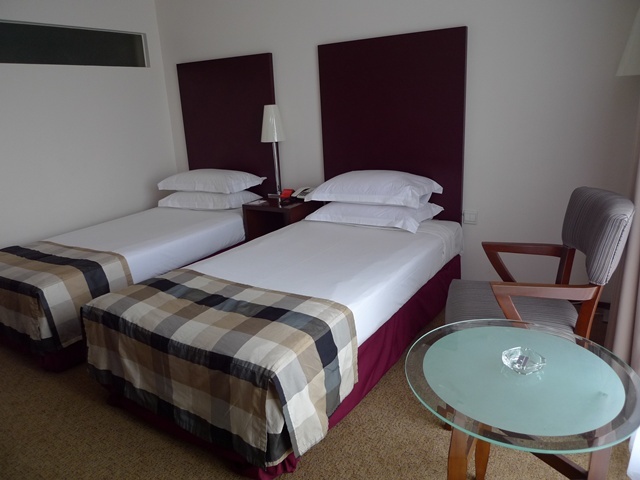 May NOT be the most spacious room I’ve slept in, but comfort comes first, and Capitol managed to deliver in most aspects …. For about RM200++ per night (~RM140++ for us civil servants), the deluxe room at Capitol did not come with breakfast, as you’ve to fork out about an additional RM20 per person for the whole deal. Wow … talk about prime location comes with a price. But credits be given where credits are due, the room is almost spotless, with cable TV, hot shower (sans bath tub), two single beds, and amenities such as iron+ironing board, electric kettle, and hair dryer. The desirable location of the hotel leads to some pros and cons. Pros being very near to hot locations such as restaurants around Changkat Bukit Bintang and Tengkat Tong Shin, eateries in malls such as Pavilion, Times Square and Starhill, as well as a stone’s throw away from hawker fare lining the evergreen Jalan Alor (Kejora, for a VERY short yet controversial stint). Transportation-wise should not be a problem, as the Bukit Bintang Monorail station is about 3 minutes’ walk away, and taxis ply this route so frequently, you’ll be ridiculed if you can’t stop one on Jalan Bukit Bintang. But be wary of unscrupulous ones, and confirm the price or the use of the meters before taking one. Food blogs are godly, I tell you. No, I’m not singing praises bout my own (hehe), but through various food blogs on the Net, I’m discovering more and more great restaurants/cafes/street food all around Malaysia, which I won’t be able to do so on my own. Heard of a new restaurant opening up at the corner of the street? Just google the name up, and voila! You’ll be surprised to see somebody has already given a piece of their mind on that place. Whereas in the olden days (OK-lah … before blogging has taken the world by storm, at least) you’ll be reading about new restaurants in the papers or magazines. Mostly posh ones on most occasions, or those in hotels which require one to put at least 2-inches-thick worth of make-up, or heels so high you’ll feel tipsy even before your shot, and for the guys, you would have revelled in the sombre mood of strictly black & whites, wondering you’re actually at a funeral or a dinner. Thanks to The Constantly Craving One, I was pleasantly surprised to know that Moussandra has yet to close down !! Some months ago, FCOE provided valuable directions to this place, only for me to fail miserably in my search as erm …. as ‘clear’ as her directions might be, I did not expect Moussandra to be tucked in such a hidden corner, and thus declared Moussandra’s CLOSED for BUSINESS. To her dismay, and my own, nonetheless. Fast forward a few months later, I came across Joe’s post on another restaurant, and surprisingly a referral to Moussandra !!! 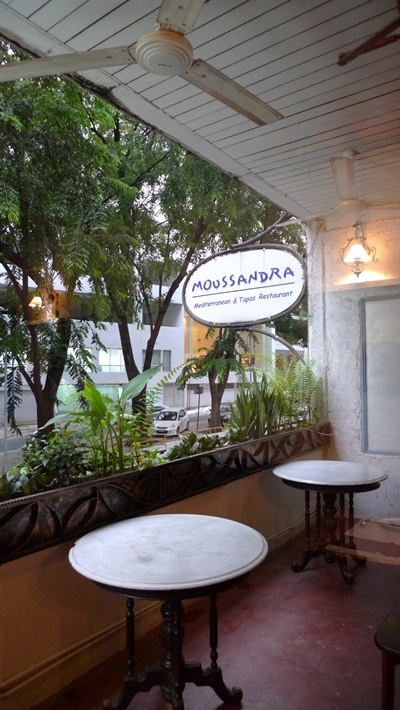 And to make a long story short (ahem ahem), I googled Moussandra and their official website (www.moussandra.com) is STILL up and running! So off we went for a dinner at the place specializing in tapas and Mediterranean food, with lots of Spanish influence on the dishes. To locate this place may not require a GPS device, but rest assured you won’t go bumping into this outlet anytime soon, lest you really look for it. 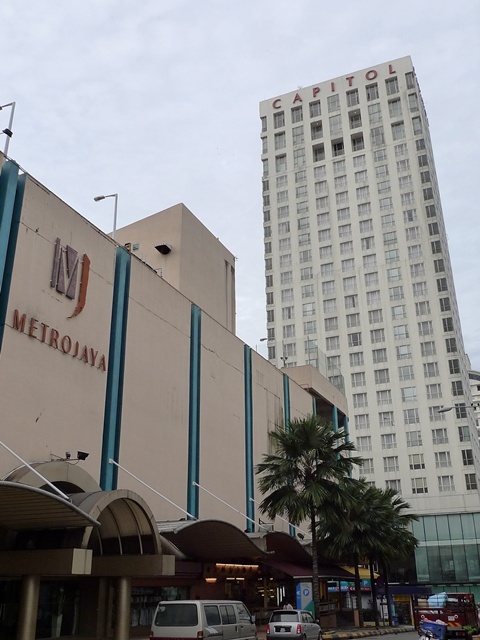 Located in KL Plaza, you can either enter from the inside, or the outside. 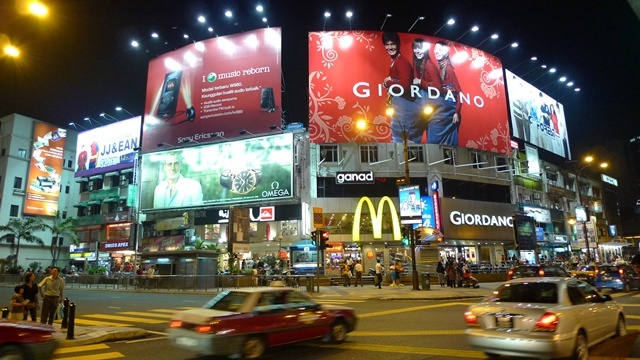 Coming from Lot 10 Shopping Centre’s direction, turn right into the lane once you passed by L’Opera on your right. 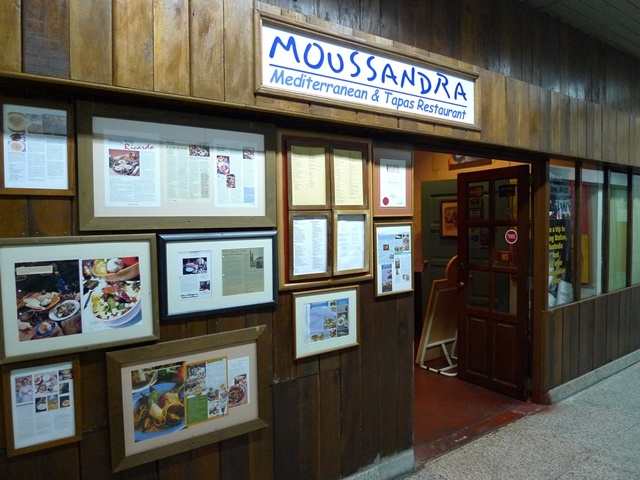 You can see Moussandra’s signboard on your left, thus walk up the stairs to enter from the backdoor. If entering through KL Plaza’s ground floor, just walk straight to the end, and turn right. But given the fact that the whole place seemed deserted (to the point of almost hauntingly eerie! ), you’ll probably feel safer walking in from the outside. 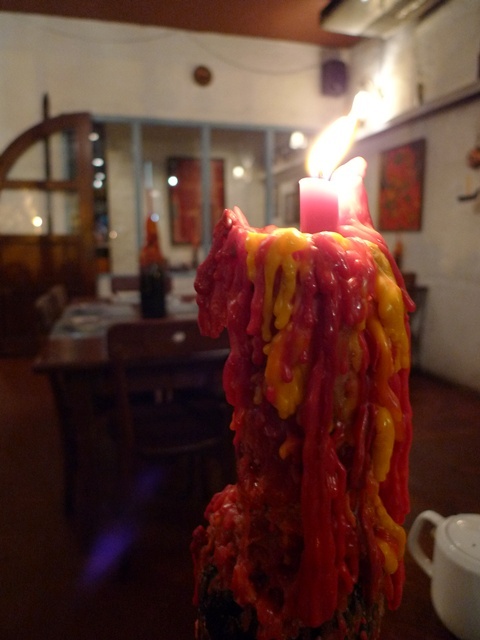 Once stepping into the restaurant, you’ll be hard-pressed not to feel as though you’ve stepped into a classic Mediterranean diner, with rustic ambience and soft lighting. The place can seat at most, about 40 diners. Perfect for a quiet dinner for two, or a comfortable family dinner without annoying interruption such as patrons breathing down your neck, or children jumping all over the place. Not to indicate that children are not welcomed though. 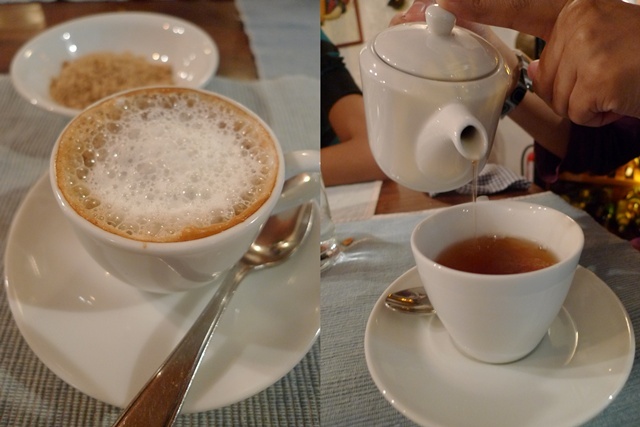 Far from it in fact, as the affable chap-of-an owner, Mr. Alphonse Peter will make anyone feel right at home. Taking over the business quite recently, he was formerly a constant patron of Moussandra’s, and as he proudly proclaimed, Food DOES Eat Into a Man’s Heart. His passion for food led him to take over the restaurant from the previous owner, though maintaining every single aspect of running the restaurant, from the cooks to the decor and menu. There are at least 30 types of tapas on the menu, divided into different categories: Vegetarian, Seafood, Meat and Others. From RM9-RM36 per serving, the starter course sized tapas are perfect complement to the various wines they’re serving, as well as appetizers to tempt the palates for more. 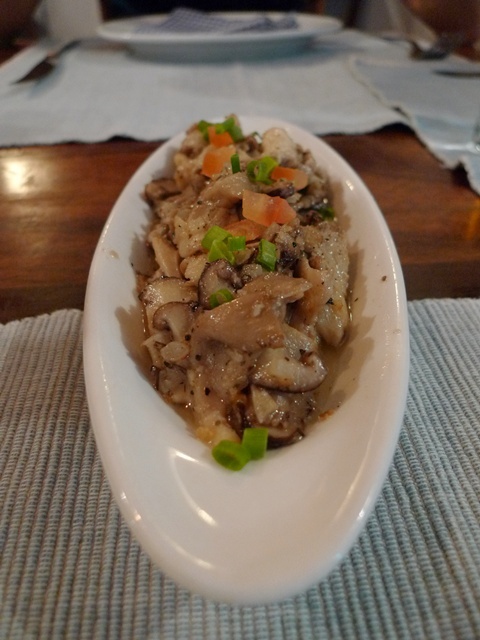 We started off with a vegetarian tapas in the form of mixed mushrooms sauteed with herbs, pepper and a dash of white wine. The mushrooms were lightly sauteed to retain their juices, while still maintaining their bite, and the peppery sauce complemented the mushrooms well. The small portion makes it ideal as a starter, and allow repeated orders of the tapas that you like, or select from the other equally tantalising choices on the menu. 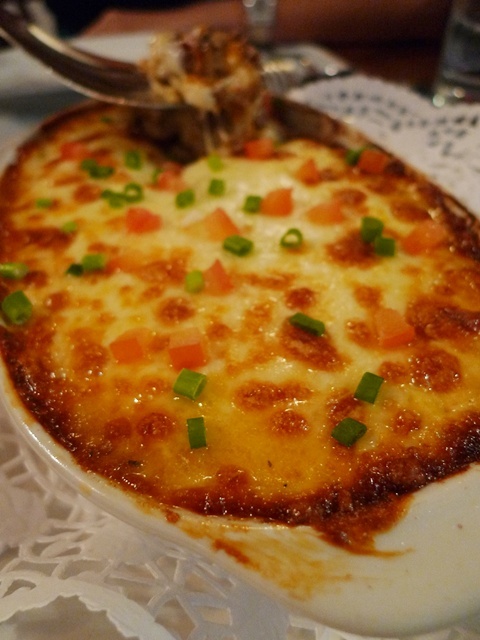 Moussaka is a Greek dish, and at Moussandra’s, the moussaka is made from layered eggplant, minced lamb, potatoes and bechamel gratinated with cheese. As you can already predict from the ingredients used in this dish, the myriad of flavours and texture resulted in the most delicious cheese-baked dish I’ve tasted so far. 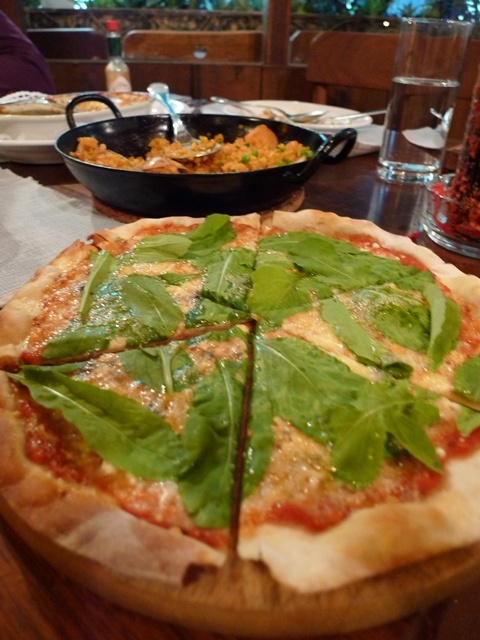 Beats the lasagne, the cheese-baked rice or seafood, and dare I say, even exceeded the pizzas served at Moussandra. The gamey flavour of the minced lamb, paired with the subtle, velvety texture of the eggplants, topped with white sauce gratinated with oozing, melted cheese. Appearance-wise may be just another lasagne-wannabe, but this is a MUST-TRY here at Moussandra. Probably stemming from his curiosity of one diner with an avid temptation to snap anything and everything on top of our table, Mr. Alphonse presented us with a pizza of his choice, on the house. Very nice of him, that’ll probably garner his restaurant brownie points. LOL. But disappointingly, the pizza was a little too salty, with the feta dominating the flavours of the other cheese, even overcoming the naturally fresh, rich and peppery taste of the rucola (rocket leaves). Hmm, let’s hope the other pizzas in his arsenal fare much better than this one. Location : Moussandra Mediterranean & Tapas Restaurant @ Sub Lot B-8, Ground Floor, KL Plaza, 179, Jalan Bukit Bintang, 55100 Kuala Lumpur. Contact No : 603-2144 0775. Website : www.moussandra.com. Opens for lunch from 12pm-3pm and dinner from 6pm-11pm. Closed on Sundays, and certain public holidays. With that, Motormouth’s signing off for now. Keeping my fingers crossed, bracing myself for the worst-case scenario ….. Wish me L-U-C-K everyone !!!! Moussaka & the Creme Brulee looks great! Did they burn the caramelize in front of you just before it's served? wow…. the foods look soooooooooo delicious. didnt know they changed owners..but yeah thought it was still opened bcos some fren was mentioning to me awhile ago only..
been awhile..but its one to keep for that quiet romantic spot.. Totally agree about food blogs being a godsend! I don’t know how I ever managed to eat well before they were around!! I love the look of this place, totally unassuming in the rapidly emptying KL Plaza! Paella paradise! I always wonder how these hidden eateries survive… hmmm. OMG!!!! nostalgic nyer!!! i think my last visit was about ten years ago! yeah, the food here is good and full of flavours. the moussaka’s a must here. the paella’s not too bad too, i think. overall, good stuff! what in the world are you being sent there for???? Haha but good experience for you 😛 and take some shots back and show us ya. I must go try the moussaka…looks yummy! Nice photos! so u finally found yr moussaka! I’m gonna to try this..looks better than the one I had elsewhere..which was pretty gd btw..
Enjoyment first before you suffer in camp? That was a nice Italian meal and good spread too. Thanks for the recommendation. eh, this place still exist ah??? oh ya, capitol hotel is much much much better than the new one in ipoh. 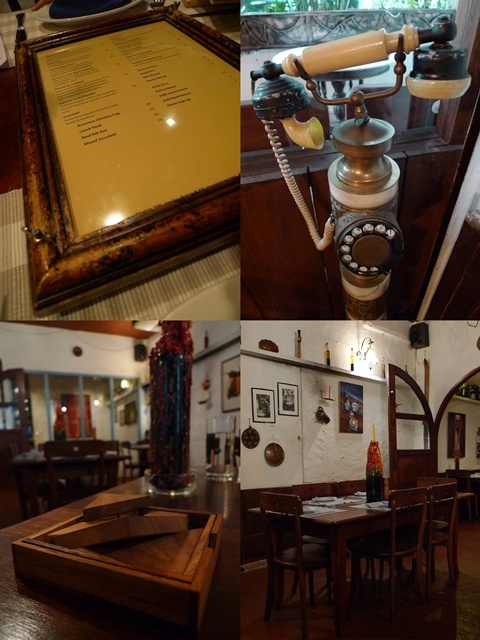 love this place, went there few years back, they serve good tapas, and their pizza, i think smoke salmon or seafood is really good, thin crust filled with toppings, the atmoshpere is good for romantic dinners too. may i know wat camera you using? Never know there is a restaurant hidden behind the busy Jalan Bukit Bintang!! the complimentary pizza looks different from the Italian pizza we used to have..ya, n u said doesnt turn out to be good also! ?but the rice looks good! kampungboycitygal : oh you work there ah? ok ok .. next time ask you bring me somewhere around there. Min : yeah, agreed the experience is priceless. allie : they burnt the custard in the kitchen before serving. Food Paradise : yeah, tucked in a corner, one has to rely on words of mouth for this one. 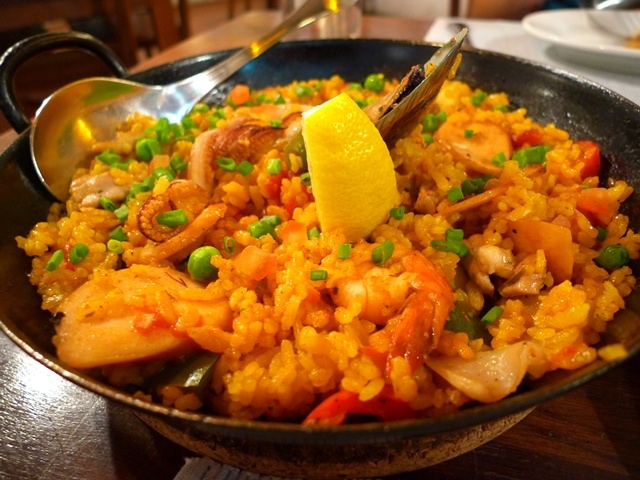 iamthewitch : paella was good, but just like what the owner said, it’s just like fried rice to him. to us, the rice was fluffy, good and tasty, yet the seafood accompaniments were nothing to shout about. Joe : agreed. he said the place was fully booked for Valentine 09. 550ml jar of faith : KL Plaza looks kinda scary nowadays. seems they’re doing reno works now. jason : survive by words of mouth, and supportive customers. and of course,a passionate owner does help a lot. Nic : i am still drooling at the thought of that rich moussaka. slurp! vk : so how did the session go? Elin : read my latest post to find out. team building, character building n stuff. ahlock : yeah, comfortable, and you can sit as long as you want. BangsarBabe : go and try it. would like to know what others think. jencooks : you’re welcome. this was a week before my camp though. NKOTB : new one in Ipoh? you came? Tower Regency is it? Vivien : I’m using LX3. sorry for the late reply. mimid3vils : yeah, ppl wouldnt walk into the backlane normally. nor would they enter KL Plaza for food! ai wei : sweet, soft, velvety and rich. 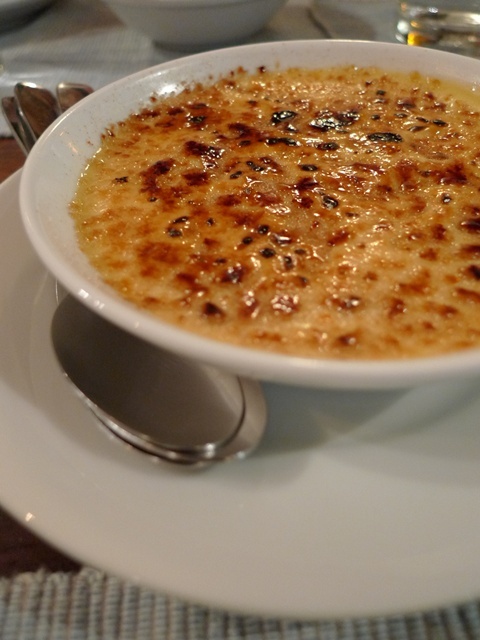 deadly creme brulee. foongpc : yeah, lying in bed, gazing at the night sky, lighted by the skyscrapers … blissful. SimpleGirl : the rice is good. whoops, guess everyone’s misunderstanding. paella’s just not what I’d order again and again, unlike the moussaka, in comparison. JC : you’re welcome, Jessey! let’s see if you like the food there as well. ck lam : that area certainly needs more restaurants, aside from those in malls. FBB : I’m now a worshipper of Moussaka. where else eh? jasmine : yeah please do. and the moussaka! like FBB said, dun think in KL you can find a lot of outlets serving them. Julian Si : thanks, Julian. going Mid-East sometimes is nice, a break from all the cafes and restaurants. I have tried it 🙂 Was goooooood!